It is a fabulous set, a true tribute to one of the great conductors of our age . . . one of the greatest Brahms' symphony cycles of all time . . . [the "Academic Festival Overture"] features some fabulous playing . . . this is world-class . . . ["Gesang der Parzen"]: the singing is superb . . . [Brahms 1]: It carries tremendous weight, and the orchestral contributions are astounding . . . [the Berlin strings are] typically fabulous . . . it is some of the most beautiful [Brahms] . . . Disc two features a gloriously played and sung "Alto Rhapsody" and a wonderful Symphony no. 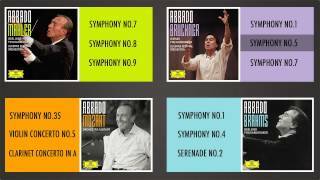 2 . . . Abbado is again able to manage orchestral balances with genuine care . . . in all respects this is world-class music making . . . [Brahms 3]: It's a masterful account . . . There are numerous personal touches that really do make all the difference; note the effortless ebb and flow of the first movement, or the unusually cogent finale . . . the "Haydn Variations" are excellent, less episodic than usual and wonderfully played . . . the Symphony no. 4 ends the cycle in a satisfying fashion. As before, the entire orchestra is exceptional, and Abbado's pacing and interpretive choices seem ideal . . . the concept of this cycle -- including the choral works to go with the more common lighter fare -- is wholly successful . . . this sturdy and attractive little box is a real find for those who want to hear the conductor at his best in Berlin. Claudio Abbado sait faire respirer la richesse des Berliner Philharmoniker avec un sens aristocratique de la grandeur, la voix amphibie de Marjana Lipovsek recherchant un ton de tragédie: version classique avec tout le confort moderne . . .